We are at present negotiating with Hal Roach, Jr., to make six one hour shows a year for TV. Happy New Year, wherever you are!. Delighted to get your nice long newsy letter from Denver a to know alls well & happy. Pleased too re the wonderful business you're having with "The Dolls & Toes" show. Thank you for the lovely Xmas Card Dear, it was kind of you to bother about it, with all the work you have on hand. I called Jacques a couple of times to your home, but no answer (about a month or two ago) & when I got your card I called again & a Lady gave me the new NO. so finally talked with Jacques. Did He tell you about our TV appearance on "This Is Your Life"? thought I'd die! will tell you all about it when I see you, in fact Ralph Edwards is sending me a copy of the film also a sound projector, so will be able to run it for you. Eda, Ben Shipman & my daughter Lois were also on the show. Please do call me when you get back Dorothy, so we can make a date to all get together - have dinner at the Fox & Hounds & then run the pictures. I have some film taken in I932, during our trip to England & a few other items you will get a kick out of. Am glad at least you are enjoying the One Nighters, but it must be awfully hard on you, & at times tough going. However am sure you are looking forward to a few days rest at home. We are at present negotiating with Hal Roach Jr. to make six one hour shows a year for TV, & have another meeting next week. They are to be costume pictures in Color, fairy tales - done in the manner of an English Pantomime, like "Babes In The Wood" "Jack the Giant Killer" etc. similar to the picture we made "Babes In Toland". which besides TV, can be played in the Theatres Abroad where we still have a big following. Have had one or two offers to make a series of 39 shorts, but its too much hard work, plus the difficulty of material. All for now Dear, Eda sends her love & joins in every good wish for '55, lots of good health & happiness - looking forward to seeing you soon. Take care of yourself, & God Bless. Re: "Laurel and Hardy Comics"
1. 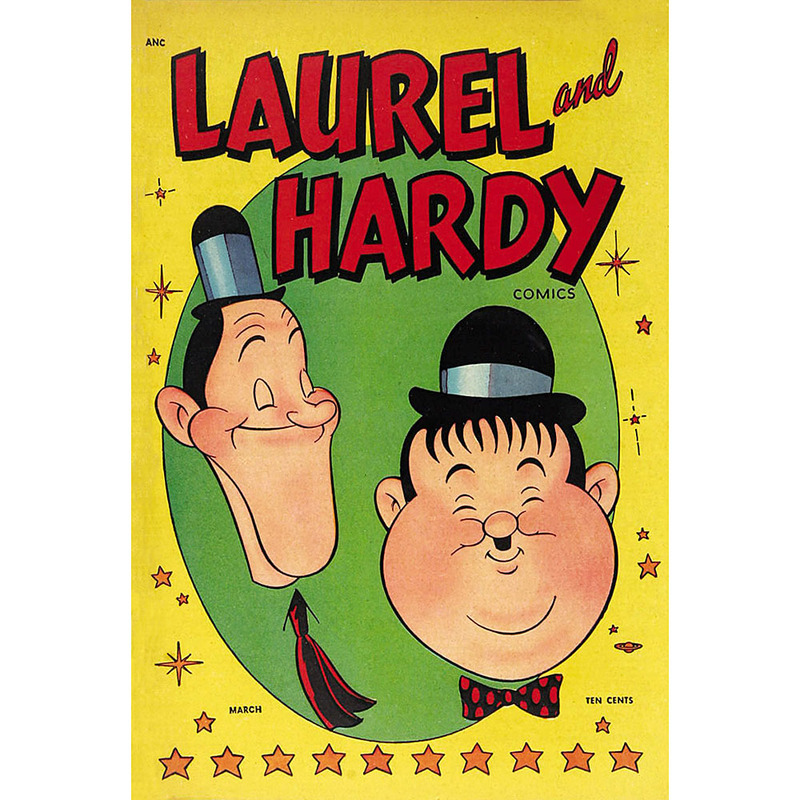 You hereby authorize and consent to the publication by us of a comics magazine to be titled "Laurel and Hardy Comics", and to be based upon representations or portrayals of your characters. You agree that such authorization and consent will not be withdrawn while this agreement remains in effect, and that during such period, you will not authorize or consent to the publication of any other magazine based upon representations or portrayals of your characters. 2. Each issue of the magazine shall depict a typical Laurel and hardy action or escapade, paralleling, in general, the style and plot structures of motion pictures in which you have appeared. All material, including but without limitation, advertising matter, contained in each issue of the magazine shall be subject to your prior approval, which you agree shall not be unreasonably withheld. We agree to make reasonable changes in accordance with your directions. You further agree that you will cooperate with us in the publication of the magazine to the extent of providing incidental advice and suggestions, if requested. In respect to advertising it is understood that no advertising is to appear in any of the magazine unless it is ethical and in good taste, as such terms are generally understood in the advertising trade. 3. We agree to publish the first issue of the magazine not later than July 30, 1955. The frequency of publication thereafter is to be determined by us, but in no event less than quarter-annually, and if we fail to publish an issue during any continuous period of one hundred and twenty (120) days, this agreement shall terminate upon the expiration of such period, except for accrued obligations, provided further, that this agreement shall terminate in any event, except for accrued obligations, two (2) years from the "on sale" date of the first issue of the magazine published hereunder. However, this agreement may be extended for an additional two (2) year period immediately upon the same terms and conditions upon notice in writing from us to you to that affect not later than sixty (60) days prior to the expiration of the original contract period hereunder. 4. The magazine shall bear the cover price of not less than ten cents per copy, and shall be distributed nationally, and at our option in Canada, with a minimum of 300,000 copies per issue. 5. In consideration of the foregoing, we agree to pay you royalties at the rate of 1/8¢ per copy for each copy of each issue published, it being understood that copies returned to us as unsold by our distributor (upon which royalties of 1/8¢ per copy have already been paid to you) may be redistributed by us or rebound or sold by us as waste paper or otherwise disposed of for salvage purposes without payment of further royalties. All payments and accountings hereunder shall be made on your behalf to William Morris Agency, Inc.
6. Upon signing of this agreement, we agree to pay you the sum of $2,000.00 as a non-returnable advance of $500.00 per issue for the first four issues to be published hereunder, and to be applicable against the royalties to become due as aforesaid. We further agree to pay you the sum of $500.00, as a non-returnable advance against royalties, upon the publication date of the fifth and each and every succeeding issue of the magazine. 7. Within thirty (30) days after the publication date of each issue of the magazine, we agree to furnish you with a duly certified statement showing in detail the number of copies of such issue manufactured and pay you thereupon the royalties or additional royalties due as aforesaid. We agree to keep accurate books accounts and records concerning the number of copies published, and you or your authorized representative shall have the right at all reasonable times to examine such books and records relating to the publication of such issues and to make extractions therefrom. The provisions of this subparagraph will survive the expiration or other termination of this agreement and will be binding upon us so long as we are obligated to account to you for the rights granted within. 8. You warrant and represent that you have the right to grant us the rights herein contained. We agree to indemnify and save you harmless against any loss or damage you may sustain by reason of any claim or action asserted against you that the material appearing in said magazine violates any copyright, proprietary right, or right of privacy of any other person, firm or corporation, or is otherwise unlawful, and upon notice from you we agree to take any and all steps to indemnify and protect you against any and all such claims or actions and against any and all damages, costs and expenses, including reasonable lawyer's fees, that you may pay or incur or become liable for by reason of the foregoing. You reserve the right to have your own counsel join in the defense of any such action, and we will notify you promptly in the event any such claim against you is made or action commenced. 9. It is understood that we are granted, upon the terms and conditions herein contained, merely the limited and restricted license to use your name and to employ the representations or portrayals of your characters only in connection with the publication of the comics magazines or books herein described. 10. In the event we breach any term or condition of this agreement or fail to render true and accurate statements if and when called for or fail to pay you the monies due hereunder in the amount and at the time provided, and any such default is not cured within ten days after written notification by you to us that such default has been committed, or in the event we shall reorganize or file a petition in bankruptcy or be adjudged a bankrupt, or make an assignment for the benefit of creditors or become insolvent, or if a receiver is appointed for our property, then upon the happening of any of such events, this agreement shall automatically and without further notice cease and terminate and thereupon neither we, or our representatives, receivers, trustees, agents and successors shall thereafter have any further right to publish, sell or deal in or with the magazine issues for which your names, characters, and all other matters are licensed under the terms of this agreement. A termination of this agreement under the provisions of this paragraph or otherwise shall not in any manner affect our obligation to account for and pay over to you any monies due by reason of the publication and sale of copies published prior to the termination hereof. 11. Any controversy or claim arising out of, or relating to, this agreement or the breach thereof, shall be settled by arbitration in New York City, in accordance with the Rules, then obtaining, of the American Arbitration Association. Any award rendered shall be final and conclusive and judgment therein may be entered in any court of the forum having jurisdiction. 12. We agree that the license granted hereunder is not assignable and that we have no right to sublicense or otherwise encumber this agreement without your written consent. If the foregoing represents your understanding of our agreement, please indicate your approval on the enclosed copy hereof, and return such copy to me; whereupon our agreement shall be deemed in effect. 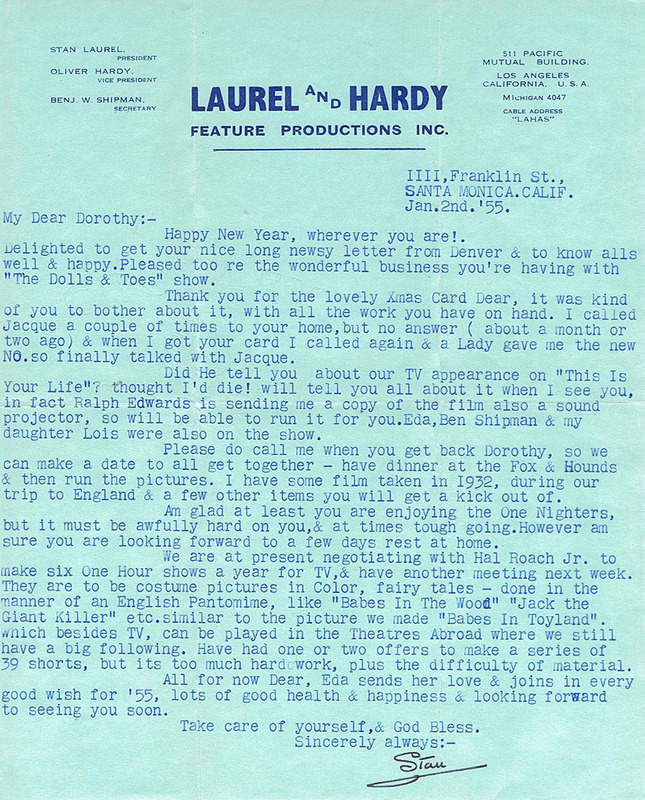 Thank you for your very nice letter, which I have just received - forwarded on from the Hal Roach Studio. It was indeed a pleasure to hear from you, & I deeply appreciate your kind thoughts, it was certainly gracious of you - many many thanks. Am delighted to know you are enjoying living in the atmosphere of the old Fort, it brings back many happy memories to me. Thanks for the invitation to visit the old place, if I happen out that way, I shall be most pleased to do so. I understand Reseda & Canoga is all built up now it is hard to realise the change, when I went out there, it was a lonely little place, miles away from anywhere, its fantastic. Is the can of film you refer to 35mm.or 16mm? however, I can have a friend of mine pick it up	& I can check it - if it does'nt belong to me I will have it returned to you. Frankly, I do'nt know if it is mine or not. With kind regards & every good wish for '55. PS: Please remember me kindly to all my old neighbours. From 1938-1946, Stan lived in a large house surrounded by a big brick wall at 20213 Strathern Street in Canoga Park, which he dubbed “Fort Laurel.” The brick wall served two purposes: it kept out the media, eager to get another photo of the distraught comedian after a series of highly publicized marriages and divorces, as well as the ex-wives themselves. Thought you would get a kick out of enclosed news clipping - can you imagine? We are negotiating with Hal Roach Jr to make four one-hour films for TV & with added footage to be released abroad in the theatres. We have a meeting tomorrow at the Studio & it looks like we may close the deal. However will let you know if anything happens. I guess its plenty cold up your way during these awful rains etc. It hasn't been too bad around here. All for now Betty - Kindest & Best to Wayne & Self. Trust alls well. Many thanks for your kind letter of the 21st.inst. also the lovely Christmas card. It was very sweet of you. Sorry the little gift was so long in reaching you - it was supposed to have been sent to you in time for Xmas. However, we were pleased to know you finally got it & enjoyed it, now you can kiss all you want & the lipstick won't Rub off! If you need any refills let me know the colour & I will send them to you. Am sending you under separate cover another little gift we thought you would like, but it will take about 4 or 5 weeks to arrive - so you can be on the look out for it. Have been reading about the terrible weather you have been having - they say the worst in years - must have been shocking - hope it has settled down by now - it is beautiful here - warm & Sunny most of the time since we returned. Am certainly glad to be living in California. Don't think we shall be coming over this year, as we have a deal pending to make a series of films for TV. here, which will also be released Abroad in the Cinemas - you'll probably be seeing one this winter - they are to be long length pictures in colour - don't know the titles yet of course, but will let you know later, so you can watch for them. It will be nice to work & stay home for a while - instead of having to travel every week & that packing & unpacking all the time. Eda sends her love & joins in every good wish for '55. Lots of luck - good health & happiness always. Haven't heard a word from Jackie Harrison since I saw him last - wish he would try to do something for himself - a great talent wasted. My love to Jackie Graham & Benny Baron if you see or write them, also Dolly Dodds. Bye Dear. I appreciated your Xmas card. Many thanks - was pleased to hear from you - don't faint - we are negotiating with Hal Roach Jr. for a picture deal - four one hour shows for TV which will also be released abroad in the cinema. They are to be costume period in color á la "Bohemian Girl" etc. (musical) Think it will work out this time as we don't have Roach Sr. to contend with & his "you know what I mean" stories - however will let you know if & when the deal is closed. Hope you had a Merry Xmas - Eda joins in every good wish for '55, lots of good luck, good health & happiness. I first started at a kindergarten at some house in Dockwray Square. It was down in a basement. Then went to a private school in Tynemouth called Gordon’s. Many thanks for your letter of the 21st.inst. just recd. this AM. Enclosed please find a money order for the amount of Five Pounds (£5.) due to being Saturday today, I am not able to get this Money order till Monday (31st). I trust it will arrive in time for the annual dinner Feb.4th. I am sending it Air Mail & Express, in hopes it will do so. I am sorry Mr Park did not handle the matter as I suggested, it would have certainly saved all this rush & confusion. It was simply my thought to have him buy a round of drinks for you all at the meeting & advise me of the cost. However, if this does'nt arrive in time for your Feb.4th. occasion, it can be used on the following meeting with my compliments. Please convey my kind regards & best wishes to all for lots of good health & happiness. PS: Thought the enclosed news clipping would be interesting to the club members. I heard this in General MacArthur's speech on television, it was very impressive. “Youth is not entirely a time of life—it is a state of mind. It is not wholly a matter of ripe cheeks, red lips or supple knees. It is a temper of the will, a quality of the imagination, a vigor of the emotions, a freshness of the deep springs of life. It means a temperamental predominance of courage over timidity, of an appetite for adventure over love of ease. “Nobody grows old by merely living a number of years. People grow old only by deserting their ideals. “Years may wrinkle the skin, but to give up interest wrinkles the soul. Worry, doubt, self-distrust, fear and despair—these are the long, long years that bow the head and turn the growing spirit back to dust. “Whatever your years, there is in every being’s heart the love of wonder, the undaunted challenge of events, the unfailing child-like appetite for what’s next, and the joy and the game of life. You are as young as your faith, as old as your doubt; as young as your self-confidence, as old as your fear; as young as your hope, as old as your despair. In the central place of every heart there is a recording chamber; so long as it receives messages of beauty, hope, cheer and courage, so long are you young.